In 2012, Marvel’s Avengers set a new record for domestic box office sales during opening weekend. At the time, that film became the champ by bringing in $207.4 million during the first days of its release. This past weekend, Jurassic World‘s Indominus Rex stomped all over that number and brought in $209 million. Kevin Feige, Head of Marvel Studios, took the Avengers’ dethroning in stride and offered the following gem via Twitter yesterday to Jurassic World‘s studio (Universal), executive producer (Steven Spielberg), director (Colin Trevorrow) and leading actor (Chris Pratt). So classy, Kev! Well done. 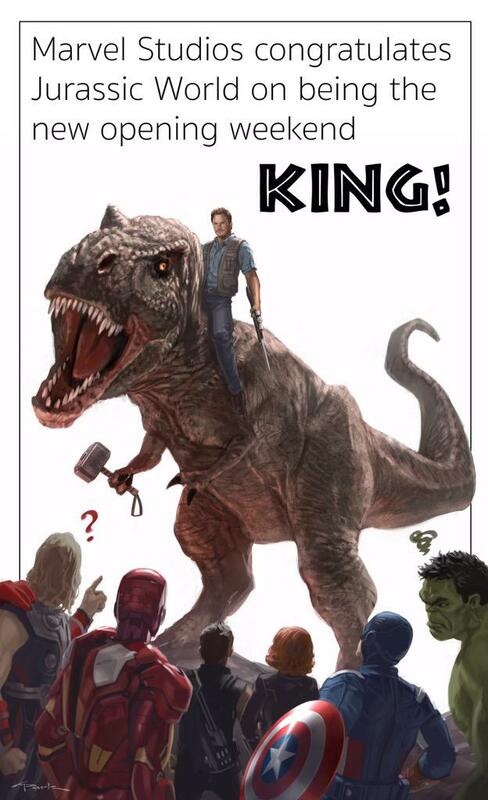 This entry was posted in Geek News, T. Mack and tagged Jurassic World, Kevin Feige, Marvel. Bookmark the permalink.